For nearly two decades, Harvest in the Square has been bringing people together to celebrate some of the best and most sustainable food New York has to offer. 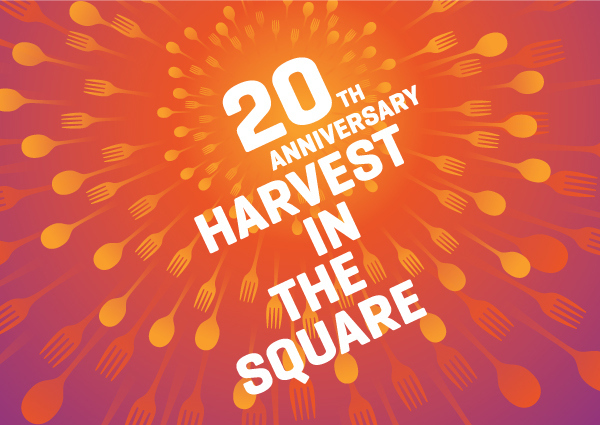 C&G Partners has designed the graphics for Harvest in the Square’s 20th Anniversary event. The graphics and eventual venue design all build on the identity system designed for Union Square Partnership, the organizers of the event. Not only has Harvest become Union Square’s premier food and wine tasting event, it is also a vitally important fundraiser for the Union Square Partnership’s work to create a strong sense of community in New York’s Union Square neighborhood. All proceeds go to improve and beautify Union Square Park. Harvest in the Square’s 20th Anniversary event on Thursday, September 17th promises to be flavorful and fun.